Your loops are a reflection of you. So, to have them trapped in a tiny box just doesn’t make any sense. 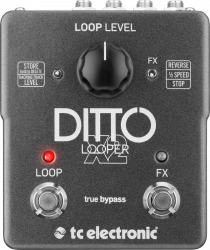 Now, you are free to export your loops and work with them in a DAW of your choice, or you can import loops and even backing tracks to and take them to gigs. Small sentence, HUGE advantage for gigging musicians! We've collaborated with JamTrackCentral to give you a package of some of the best backing tracks available. The tracks are expertly recorded, feature solos by top guitarists and - best of all - they're free of charge when you buy a Ditto X2!